More than a Student Management System. Truss RTO is Smarter, Friendlier, AVETMISS Compliant Student Management and much more, Truss helps your RTO save time and money and present your best face to your students. You can watch our video demos of our software in action or read about our ongoing feature releases, but the best way to really see the difference Truss brings is to see it in action for yourself with a personalised demo. Not all Student Management Systems are alike. From clarity of pricing to ease of use, from device compatibility to secure electronic certificates, find out why you should choose Truss for your RTO. Minor Software Update - Automatic Screen Resizing. In a newly released update to the Truss RTO software system, we've deployed fixes to allow devices with smaller screen sizes to work better within Truss RTO. On intermediate screen sizes such as large tablets, landscape tablets or smaller laptops, the Truss RTO system will now scales dashboard content and text to fit better and to be easier to read. These changes have been rolled out to all sections of the Truss RTO platform dashboard, you might notice font sizes drawing slightly smaller to fit in as much content as possible. The newly released August 2018 update brings improvements to the documentation of the Truss RTO system by introducing the much awaited Contextual Help feature. In the top right corner of any page in your Truss system you'll see a question mark icon, click that to bring in a sidebar article with additional help documentation relating directly to the screen you're looking at. We have also launched Tours, these are interactive walkthroughs of the Truss RTO system for first time users. Smarter, Friendlier Student Management. Truss RTO revolutionises day-to-day life for growing RTOs. 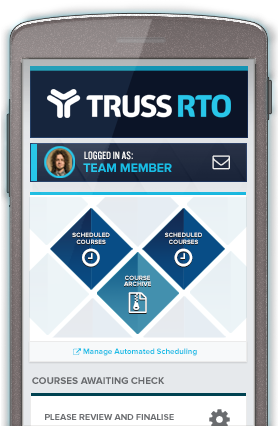 Truss RTO is a Student Management System suited to growing RTOs whether they deliver training online, face to face, or blended. Truss RTO can process bookings for your courses online via any internet-enabled device. It collects full AVETMISS data from your students and performs live USI validation. It helps you manage your compliance load including AVETMISS reporting and audit facilities (including state funding and CRICOS), automatic electronic certificate issue including verification and security, and can be tailored to the needs of any growing RTO. We've been building bespoke cloud-based systems for RTOs since 2009 but now we're making the advantages of cloud available to RTOs all over Australia. Truss RTO is a full-featured, matured system with years of development behind it. Here's how we got here. Back in 2008, Truss began life as Jack Marlow, providing website and bespoke CRM services to businesses across Australia. One of our early clients was a national RTO, starting us down the road to build Truss RTO. In mid 2010, we went live with our first cloud RTO Management System, built bespoke for a single client, built to assist with managing many stakeholders across multiple locations. During 2014 the underlying Truss platform was re-engineered substantially to make it responsive - automatically restructuring all views to work well across any internet capable device, from smartphone to desktop. In 2015 we standardised our RTO offering, by now in the hands of several clients, to solve a number of problems across the industry that existing platforms weren't doing as well as they could. With a focus on short courses, but the capability to handle qualifications, our system, as an attractive, easy to use single platform solution, broke new ground. In early 2016, Truss took on seed investment from a Sydney financial services firm to help us grow Truss Education's products to service the entirety of the RTO sector. Growing our team size and investing heavily in product development, our product was consolidated and expanded to integrate eLearning capabilities and much more. By late 2016, Truss RTO had grown from its humble beginnings as a bespoke system focused on fee for service short courses to a comprehensive, full-featured student management supporting courses up to Advanced Diploma, CRICOS (including an Agent Portal) and all state funding models including VET FEE-HELP. Each month we release improvements and new features for our clients at no charge. We can help you move seamlessly from VETtrak, JobReady RTO, other off-the-shelf systems or even your own home-built Student Database to Truss RTO. For taking bookings from your students, Truss RTO can function standalone, as part of a website built by us, or can be easily embedded into your existing website - start taking paid enrolments online today!